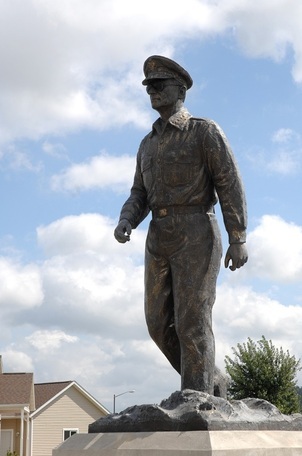 To the left of the Eisenhower statue and memorial is a memorial to General Douglas MacArthur. a 5 star General and commander of the Pacific forces in WW 2. Douglas MacArthur was born at the Little Rock Army Barracks in Arkansas, where he began his life of discipline with the United States Army. His parents were Civil War hero Lt. General Arthur MacArthur and Mary Pinkney Hardy MacArthur. Douglas would grow up to be a highly intelligent, heroic, egotistical and controversial five-star general. Young Douglas soon learned that a MacArthur must first become a scholar and gentleman. At the age of six, Douglas transferred with his family to Ft. Leavenworth, Kansas, then three years later to Washington, D.C., where his father, Captain MacArthur took a post in the War Department. Despite General Dwight D. Eisenhower`s direct assistance from Washington, MacArthur did not have the resources to build a force capable of holding off the Japanese. The attack on Pearl Harbor, December 7, 1941, was the crushing point of MacArthur`s army in the Philippines. His army and air force were quickly pulverized, and by January, the remainders of his men were forced onto the Bataan Peninsula. While his forces struggled to survive, MacArthur could only watch from his command on the island of Corregidor at the mouth of Manila Bay. MacArthur spent much of 1942 accumulating men and material. Late that year, he commenced his mighty offensive against the Japanese. By early 1944, his soldiers were victorious in most of New Guinea, New Britain, the Solomons, and the Admiralty Islands. On October 20, 1944, his forces invaded Leyte Island in the Philippines. He trudged ashore with his men at Leyte. By doing so, MacArthur fulfilled his promise to return. Six months later, all of the Philippines were liberated from the Japanese. The Korean War began in 1950. After North Korean Communists invaded South Korea in 1950, MacArthur was appointed the Supreme United Nations commander. After the Chinese Communists entered the war on the side of the North Koreans, MacArthur wanted to attack the Chinese mainland. His enthusiasm for pushing on and attacking areas of China was not shared by President Truman. On April 11, 1951, MacArthur was relieved of his command by the president. MacArthur, always straightforward with his opinions, had publicly disagreed with Washington`s campaign strategies, which in the American system of government, military leaders are not permitted to do. General Matthew B. Ridgway replaced MacArthur and stabilized the military situation near the 38th parallel. MacArthur was recalled to active duty in 1941 as commander of United States Army Forces in the Far East. A series of disasters followed, starting with the destruction of his air forces on 8 December 1941, and the invasion of the Philippines by the Japanese. MacArthur's forces were soon compelled to withdraw to Bataan, where they held out until May 1942. In March 1942, MacArthur, his family and his staff left nearbyCorregidor Island in PT boats and escaped to Australia, where MacArthur became Supreme Commander, Southwest Pacific Area. For his defense of the Philippines, MacArthur was awarded the Medal of Honor. After more than two years of fighting in the Pacific, he fulfilled a promise to return to the Philippines. He officially accepted Japan's surrender on 2 September 1945, and oversaw the occupation of Japanfrom 1945 to 1951. As the effective ruler of Japan, he oversaw sweeping economic, political and social changes. He led the United Nations Command in the Korean War until he was removed from command by President Harry S. Truman on 11 April 1951. He later became Chairman of the Board of Remington Rand. 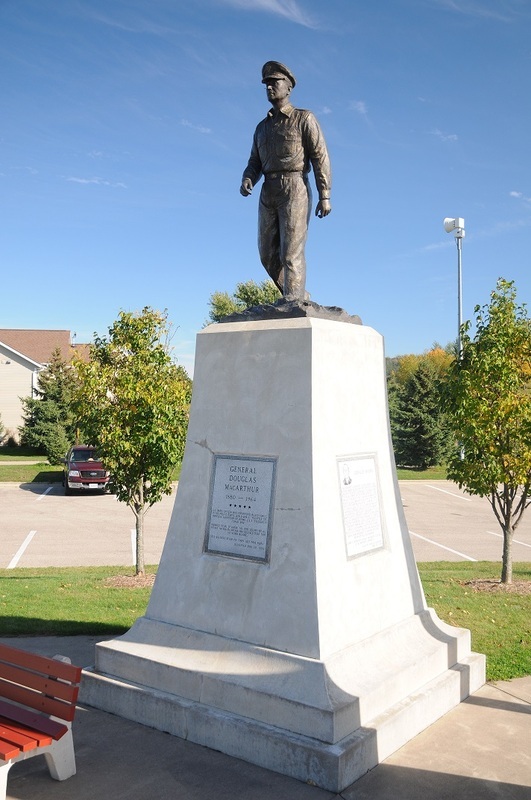 Raised in a military family in the American Old West, MacArthur was valedictorian at the West Texas Military Academy, and First Captain at the United States Military Academy at West Point, where he graduated top of the class of 1903. During the 1914 United States occupation of Veracruz, he conducted a reconnaissancemission, for which he was nominated for the Medal of Honor. In 1917, he was promoted from major to colonel and became chief of staff of the 42nd (Rainbow) Division. In the fighting on the Western Front during World War I, he rose to the rank of brigadier general, was again nominated for a Medal of Honor, and was awarded theDistinguished Service Cross twice and the Silver Star seven times. From 1919 to 1922, MacArthur served as Superintendent of the U.S. Military Academy at West Point, where he attempted a series of reforms. His next assignment was in the Philippines, where in 1924 he was instrumental in quelling the Philippine Scout Mutiny. In 1925, he became the Army's youngest major general. He served on the court martial of Brigadier General Billy Mitchell and was president of the American Olympic Committeeduring the 1928 Summer Olympics in Amsterdam. In 1930, he became Chief of Staff of the United States Army. As such, he was involved in the expulsion of the Bonus Army protesters from Washington, D.C. in 1932, and the establishment and organization of the Civilian Conservation Corps. He retired from the U.S. Army in 1937 to become Military Advisor to the Commonwealth Government of the Philippines. 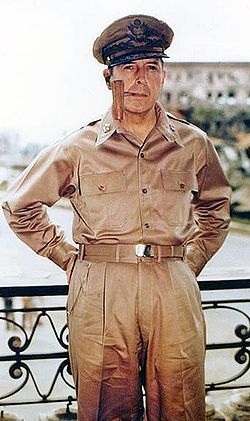 MacArthur was recalled to active duty in 1941 as commander of United States Army Forces in the Far East. A series of disasters followed, starting with the destruction of his air forces on 8 December 1941, and the invasion of the Philippines by the Japanese. MacArthur's forces were soon compelled to withdraw to Bataan, where they held out until May 1942. In March 1942, MacArthur, his family and his staff left nearby Corregidor Island in PT boats and escaped to Australia, where MacArthur became Supreme Commander, Southwest Pacific Area. For his defense of the Philippines, MacArthur was awarded the Medal of Honor. After more than two years of fighting in the Pacific, he fulfilled a promise to return to the Philippines. He officially accepted Japan's surrenderon 2 September 1945, and oversaw the occupation of Japan from 1945 to 1951. As the effective ruler of Japan, he oversaw sweeping economic, political and social changes. He led the United Nations Command in theKorean War until he was removed from command by President Harry S. Truman on 11 April 1951. He later became Chairman of the Board of Remington Rand.